Toyota started the production of 3.0 liter 3VZ-FE engine in 1987 as the new engine for Toyota 4Runner. This engine was installed in other off-road Toyota models in the future. The engine is similar to its predecessor the 2VZ engine, but the more significant displacement is not the one difference. The cast iron cylinder block looks the same, but it is taller by 20 mm (the height is 223 mm). The angle between cylinders in V-shape configuration of the block is 60 deg. Inside the block, there is new forged crankshaft with nine counterweights and 82 mm stroke. The early version of this engine 3VZ-E has SOHC aluminum cylinder heads and original pistons. The compression ratio of these engines is only 9.0:1. The redeveloped version and more performance engine the 3VZ-FE was produced from 1992 to 1997. The 3VZ-FE got aluminum DOHC heads with the increased diameter of the intake valves to 34 mm from 33 mm. The engine doesn't have hydraulic lifters. The shape of intake valves also was changed. 27.3 mm is the diameter of the exhaust valves. There are numbers for adjusting valve gaps: 0.25-0.35 mm intake, 0.15-0.25 mm exhaust. 3VZ camshaft specs: duration - 230 intake 230 exhaust, 12 deg overlap, 7.85 mm intake lift (or .31"), 7.6 mm exhaust lift (or .30"). Timing belt drives the intake cams. The exhaust cam is driven by intake camshaft through gear in the middle of the cylinder head. The engine has variable geometry intake manifold called ACIS by Toyota. The exhaust system also was tuned and optimized. The engine was designed to be installed with 15 deg angle to use it in many applications. The manufacturer slowly replaced 3VZ-FE engine since 1994 by 1MZ-FE, but 3VZ got new life as the 3.4 liter 5VZ-FE in 1995. First of all the engine has the problem with overheating. The reason can hide in the bad head gasket. Also, the coolant fan doesn't do its job as good as should. Try to keep the radiator clean and the required coolant level for this engine to prevent overheating in the future. The 3VZ has the issue with increased connecting rod bearings wear and cylinder head cracks. The engine life is about 180,000 miles (300,000 km). 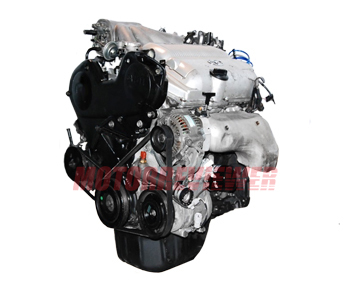 Increased oil consumption or knocking noises from cylinder block area can recognize a soon death.